Install a two-lane extension of Gateway Boulevard connecting to the west with existing Bullittsville Road. Construct a multi-use path to extend the existing pedestrian accommodations from KY 237 to Bullittsville Road. By improving east-west mobility between KY 237 (North Bend Road) and Bullittsville Road, additional routes will be available connecting Hebron to I-275. Travel demand and dependency on KY 237 and KY 20 (Petersburg Road) will be reduced. This roadway will improve access to future industrial development along Bullittsville Road. By providing pedestrian accommodations, there will be a new east-west connection between the proposed multi-use path on KY 237 and the proposed multi-use path on Bullittsville Road. The conceptual alignment of the recommended Youell Road Connector indicates a possible connection to KY 237 at the existing Gateway Boulevard intersection. The construction of the Gateway Boulevard extension will complete the connection of this roadway to Bullittsville Road. The multi-use path that is included in this recommendation supports Boone County’s goal of improving bicycle and pedestrian connectivity and safety throughout the county. Click HERE for a map of multi-use paths in Boone County. Coordination between the Bullittsville Road Phase 1 improvement and planned development is needed to determine the best location for this new roadway extension’s connection with Bullittsville Road. 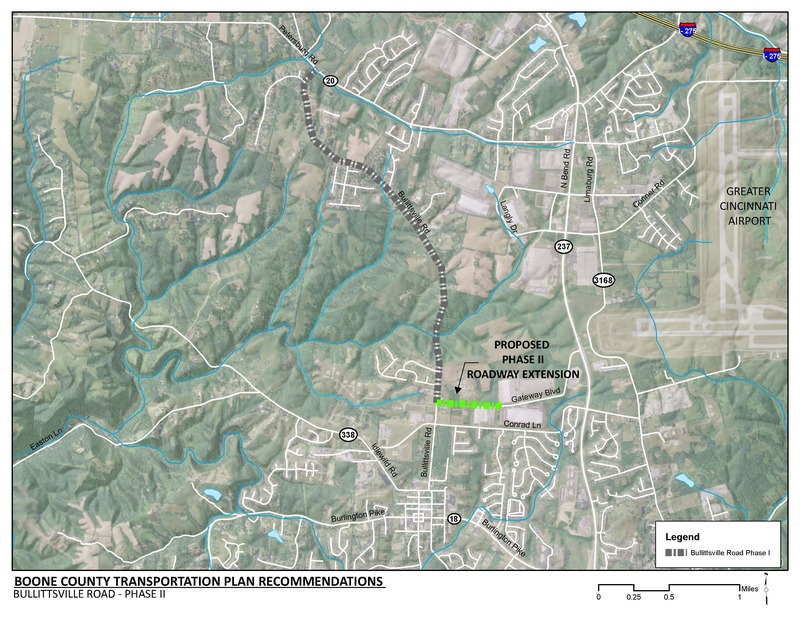 Depending on the preferred alignment, the project may require crossing Allen Fork. A potential historic site on the National Register of Historic Places has been identified in the project area. Additional right-of-way will be required to construct this new roadway extension of Gateway Boulevard. Currently, the only east-west connection between KY 237 and Bullittsville Road is Conrad Lane. Existing land uses served by this roadway are primarily agricultural, woodlands, institutional and industrial. Land use expected in this area for 2040 is primarily business parks. An additional 500 jobs are expected by 2040 in the properties south of Gateway Boulevard. There are several multi-use path projects that are currently in design or included in a recommendation that will connect to this project. There is a multi-use path project along KY 237 that has received funding. Multi-use paths are also recommended in the Bullittsville Road Phase 1 and Youell Road Connector projects.